Inheriting two copies of mutated genes that are nonfunctional can have lethal consequences. An inheritance pattern in which an allele is only lethal in the homozygous form and in which the heterozygote may be normal or have some altered non-lethal phenotype is referred to as recessive lethal. The dominant lethal inheritance pattern is one in which an allele is lethal both in the homozygote and the heterozygote; this allele can only be transmitted if the lethality phenotype occurs after reproductive age. Dominant lethal alleles are very rare because the allele only lasts one generation and is, therefore, not usually transmitted. In the case where dominant lethal alleles might not be expressed until adulthood, the allele may be unknowingly passed on, resulting in a delayed death in both generations. A large proportion of genes in an individual’s genome are essential for survival. Occasionally, a nonfunctional allele for an essential gene can arise by mutation and be transmitted in a population as long as individuals with this allele also have a wild-type, functional copy. The wild-type allele functions at a capacity sufficient to sustain life and is, therefore, considered to be dominant over the nonfunctional allele. However, consider two heterozygous parents that have a genotype of wild-type/nonfunctional mutant for a hypothetical essential gene. In one quarter of their offspring, we would expect to observe individuals that are homozygous recessive for the nonfunctional allele. Because the gene is essential, these individuals might fail to develop past fertilization, die in utero, or die later in life, depending on what life stage requires this gene. An inheritance pattern in which an allele is only lethal in the homozygous form and in which the heterozygote may be normal or have some altered non-lethal phenotype is referred to as recessive lethal. For crosses between heterozygous individuals with a recessive lethal allele that causes death before birth when homozygous, only wild-type homozygotes and heterozygotes would be observed. The genotypic ratio would therefore be 2:1. In other instances, the recessive lethal allele might also exhibit a dominant (but not lethal) phenotype in the heterozygote. For instance, the recessive lethal Curly allele in Drosophila affects wing shape in the heterozygote form, but is lethal in the homozygote. 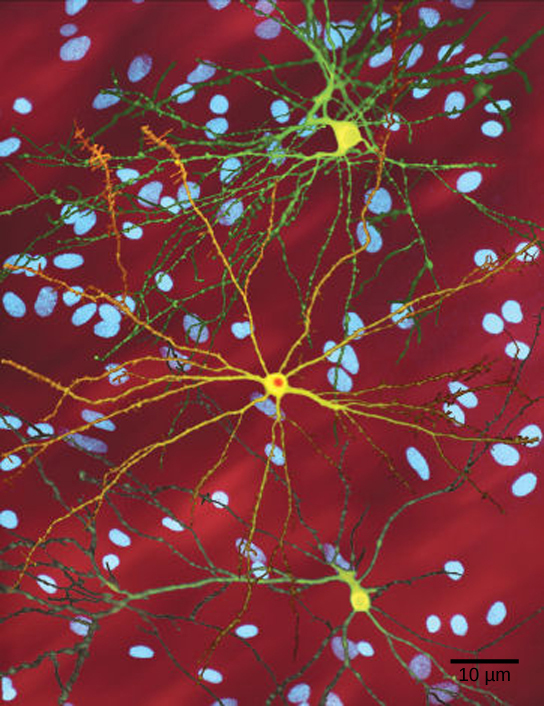 Effects of Huntington’s disease on neurons: The neuron in the center of this micrograph (yellow) has nuclear inclusions characteristic of Huntington’s disease (orange area in the center of the neuron). Huntington’s disease occurs when an abnormal dominant allele for the Huntington gene is present. A single copy of the wild-type allele is not always sufficient for normal functioning or even survival. The dominant lethal inheritance pattern is one in which an allele is lethal both in the homozygote and the heterozygote; this allele can only be transmitted if the lethality phenotype occurs after reproductive age. Individuals with mutations that result in dominant lethal alleles fail to survive even in the heterozygote form. Dominant lethal alleles are very rare because, as you might expect, the allele only lasts one generation and is not transmitted. However, just as the recessive lethal allele might not immediately manifest the phenotype of death, dominant lethal alleles also might not be expressed until adulthood. Once the individual reaches reproductive age, the allele may be unknowingly passed on, resulting in a delayed death in both generations. An example of this in humans is Huntington’s disease in which the nervous system gradually wastes away. People who are heterozygous for the dominant Huntington allele (Hh) will inevitably develop the fatal disease. However, the onset of Huntington’s disease may not occur until age 40, at which point the afflicted persons may have already passed the allele to 50 percent of their offspring.